The Viparspectra 600w LED Reflective Series Grow Light is a light that can be handled by an experienced grower and novice alike. An all-time favorite for plant cultivation indoors for all stages of plant growth. In other words, we could not wait to review the Viparspectra 600w LED grow light. What is so special about the Viparspectra 600 Watt LED? 600 watts of LED grow light power can come in handy for all stages of plant growth. Viparspectra’s 600w version is similar to that of the quality seen in platinum led grow lights but with a few added benefits such as cost. Hands down, because of this LED’s capacity, full spectrum light chipset and ease of functionality, the Viparspectra 600w is one of the best lights in this watt range for growing awesome cannabis. It can handle just about any plant strain from veg to flower. Viparspectra from a manufacturers point of view is one of the most reputable. Offering a great warranty and customer service, their pride in their lighting shines through. Our Viparspectra reviews typically go well and the Viparspectra 600 watt review is no exception. With many light emitting diode hours under our belts using this lamp the VIPARSPECTRA 600W LED is one of the main LED grow lights in our arsenal. When thinking about this LED there are many options to consider, but luckily Viparspectra makes things pretty straight forward and simple from an operating perspective. The price of the Viparspectra V600 600 Watt puts it right on par with its competition but comes with a great brand name like Viparspectra as well as a warranty that backs it up. The company itself is built around growers. Growers that are experienced when it comes to using LED lights for growing cannabis particularly. This means they have focused their knowledge of plant cycles, the light it needs and the demands a grow tent can place on growing indoors. Everything from heat dissipation and lighting spectrum has been carefully designed around one thing. That thing is growing cannabis plants. I have to concede that this light is so well rounded I will be using it on many more grows this season if time allows with all the other LED grow lights we are testing and reviewing currently. With this particular LED grow light, space, however, is not much of an issue. It can easily fit within a 3 x 3-foot area and not generate to much heat. A light that is perfect in a small tent such as the Mars Hydro 27 x 27 grow tent. Especially when compared with an older type bulb without LED technology. As a newer product in the Viparspectra arsenal, I was drawn to it naturally as time progress, the technology behind these advanced lights also grows. What is The Viparspectra 600w Like? With its sleek black matte finish and solid box construction, it not only grows well but looks pretty good. A well-engineered product using quality materials. You can easily get a feel for the thought placed into this light rig for growers. Every bulb, screw, fan, and joint seems to have a purpose and reason. Every last detail down to the heat sinks is carefully made using materials such as high-grade aluminum. (LED) Light Emitting Diodes – With 120 red, white & blue five-watt Bridgelux/Epileds full spectrum LED’s the growth from these bulbs is just about perfect with useful light that your plants will readily absorb. Heat Sinks & Cooling Fans – The 600 Watt model boasts a pair of 4.72-inch cooling fans that powerfully and quietly move the heated air out and up, away from your plants to reduce heat stress while cultivating your buds. The heat sinks act as heat absorbs to extensively chill the air back down and keep the temps low. This is done by dissipating the heat through the aluminum heat sinks. This keeps the unit hovering around 80 degrees. I was able to place the Viparspectra 600w around 2 feet above the plant canopies which seemed to do the trick for a proper growing distance using these full spectrum lights. Energy Efficiency – Consuming around 275 watts, this Viparspectra saves you a ton of money in energy bills. Especially when you compare it to HPS bulbs of the same light emission power. Daisy Chain Capabilities – As your indoor grow operation builds, space might become an issue. We only used one light in a small 3 x 4 tent but this feature would come in handy as you add more plants to the mix. The daisy chain makes it very easy to grow your grow. Simply plug into the next LED light and power up the lighting. IR Lighting – Getting the light bandwidth perfect for growing your garden. Covering an array of Infrared Light that plants need for photosynthesis is the key element. LED lights of yesterday miss out on this primal plant growth function. These days, lighting has gotten so much more advanced. I always laugh when an old school grower mentions their distaste for LED such as the Viparspectra 600w. LED grow lights such as this have come along way in the past 5 years. With the included hangers and easy attach post on each corner the LED light was easy to install. It did fit snugly in our tent at 3 x 4. I would recommend at least another foot of clearance as we had to make some modifications to the tent and eventually swapped it out for a 4 x 4 grow tent instead making things a bit more complicated than they should have been. This was by no means a reflection on the light however and more to do with our oversight, especially as the plants began to bud and flower. It wasn’t too bad because of the nifty and highly adjustable hanging system that Viparspectra provides. With its compact array of full spectrum LED’s, the Viparspectra 600w can produce a decent yield. There are many factors that go into a great yield. Assuming you have PH balanced your water, created the perfect humidity and temps in your tent and tended to your plants methodically, this 600 watt LED grow light has what it takes to produce big and beautiful plants. We typically see Viparspectra 600w yields around 2 grams per watt but keep in mind this is around 247 watts so likely you can produce almost 1 pound from a single trained plant if all goes well. We found while growing with the Viparspectra 600w that the best distance from the plant should be around 25 inches to start in Veg. Once Veg kicks in, it is safe to say lowering gradually to 18 inches does the trick. Of course, your plants, if healthy will close the height gap quickly where you won’t have to maneuver the lights much. Luckily the hanging wires are easily adjustable with this LED grow light. Out of the Viparspectra line up that I have reviewed, I would say the Viparspectra 600 watt growing light is the top of the line Viparspectra in its class. Outshining many of the competitors with its low energy output and solid, easy to use design. This light will yield an abundance of healthy plants, no matter what you put in the soil. The simplicity of switching between plant cycles, from veg to flowering is basic at best. With only a couple of drawbacks, such as the light is not waterproof so an indoor greenhouse is probably out of the question, but overall the price of this light is what bumps it up in rank. In fact you would spend far less on these lights compared to an HPS of the same equivalent. 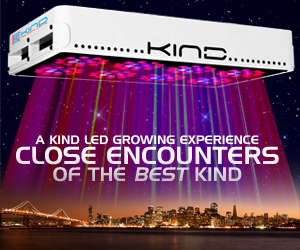 If you need a little more power check out our 1000 watt led grow light reviews. It produced a decent yield after all was said and done. Although a bit more blue light balance would have been better for flowering, it still provides ample spectrum to get the job done.